Clouds will be rolling in to Olympia Friday night! Join me to celebrate A Sideways Look at Clouds, my new natural-history memoir published by Mountaineers Books. The evening will include a few words and a book reading by me, Q&A by you and me, book sales by Olympia’s fabulous Browsers Bookshop, cloud-themed food (see menu below). And lots of clouds. Greetings Friends! 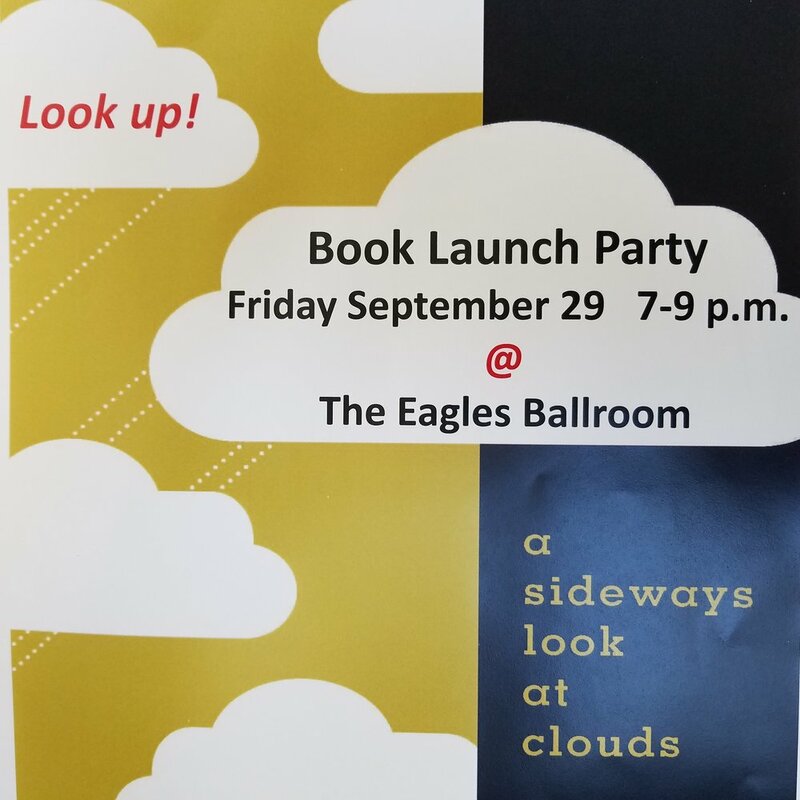 One last reminder to join me to celebrate A Sideways Look at Clouds, my new natural-history memoir published by Mountaineers Books. The evening will include a introduction to my book, Q&A, book sales by Olympia’s fabulous Browsers Bookshop, cloud-themed food (see menu below). And lots of clouds. Hope to see you there! Cloud Break wines, Fish Tale Organic IPA, sparkling water, ginger ale. The Eagles Ballroom is at 805 4th Ave E (at Plum St.) in Olympia. There is free on-street parking on 4th and Pear St. (the most convenient). There are a few spaces in the Eagle's Ballroom lot just north of the building off 4th Ave. AND at Always Safe & Lock off 4th Ave just north of Plum. AND in the larger parking lot of the Lottery Administrative HQ on the north side of 4th east of Plum. Here is a link to a map. If you cannot attend, please visit Browsers Bookshop in downtown Olympia to purchase your copy! Browsers will even shipped signed/inscribed copies to all your out-of-town friends and family! A Sideways Look at Clouds is also available at other brick-and-mortar bookstores (chains and indies) as well as through online booksellers, including Mountaineers Books.